When we were in Rome for our honeymoon years ago, we stopped by a little walk-up pizza counter near the Vatican, the Pizzerium, run by renowned pizzaiolo Gabriele Bonci. The pizza was delicious, and served al taglio – by the piece – which in the case of Roman-style pizza means cut by scissors and priced by weight. Roman style pizza is served on a somewhat thick crust with the texture of focaccia bread, with an abundance of topping varieties. We never expected to have Bonci pizza again (short of taking another trip to Rome) so we were floored when we heard that Bonci himself was opening his first overseas location in Chicago. Bonci himself supervised the opening of the Chicago shop, the eponymous Bonci (161 N Sangamon St. Chicago, IL) over the summer of 2017, and by the time we arrived in December, it seemed to be a well-oiled machine. The Chicago Bonci location was similar to the Roman one – except supersized. The concept is the same – you peruse the pizzas on display and get slices to order, which are then, cut, weighed, heated up and brought out to you. When we were at Bonci there were at least a dozen pizzas on display. They varied by weight but most were $10.99 – $14.99 a pound. You can get any size you want, but we went with the smallest samples possible so we could try many varieties (which ran us about $3.50). The flavor combos ranged from classic margherita, to spicy meatball to salmon, and there is something for every taste. We started out with 3 varieties, but then went back for 2 more. On our first trip we sampled ricotta, zucchini and lemon; anchovy and zucchini; and arrabiata (red sauce and spicy pepper). We followed up with potato and rosemary, and arugula and prosciutto. As we waited for our order to be heated up, we grabbed some stools behind the counter and watched the pizzaiolos do their thing – pressing the dough into rectangular pans and sprinkling toppings across the surface. One of the great things was that in less than 20 minutes, there were already some new pizza varieties to try on our second trip. We really enjoyed all of the pizzas, and we appreciated the attention to detail in the chewy, flavorful crust and all of the super-fresh toppings. Most of the pizzas did not come with red sauce, and all of the cheeses were fresh and delicate. Our favorite slice of the day was the ricotta with lemon, which was light, fresh and bright – and we felt like we could eat a whole pizza! The service at Bonci was also excellent, and when the GM noticed that our slices did not have enough arugula, he brought some over himself. If you are thirsty, there is still and fizzy water on tap along with a selection of Italian soft drinks, single-serve wines and beers. Unlike the Rome location, there are counters along the wall to sit, though a good deal of the patrons were taking their pizzas to go. All told, we were stuffed with top-notch pizza for less than $20. If you like high-quality pizza, we highly recommend that you give Bonci a try – it is a little slice of Rome right here in Chicago. The cheese plate at Cleveland’s French stalwart L’Albatros (11401 Bellflower Rd.) is the best one we have ever tried. Usually, when you order a cheese plate at a restaurant, you get a small plate of pre-selected cheeses. Maybe at better restaurants you choose from 10 or so cheeses off of a list. One of the most disappointing things about cheese plates is either that they have repetitive, common cheeses, or the servers have no idea how to direct you to the right cheese selection. However, at L’Albatros, nothing is left to chance, and the staff goes above and beyond to help you get the right selections. You can get the cheese plate for either lunch or dinner, and you can select either 3 ($11), 5($14) or 7 ($17) cheeses. There are no pre-set selections, and the cheesemonger comes over to your table with a giant tray of dozens of cheeses, and you can talk about what you want, and even have samples! Check out at the amount of cheese to choose from (plus there were even more that didn’t fit into the frame). Tomme de Savoie – France – A good start, Tomme is a semi-soft cow’s milk cheese with a mild flavor. Cantal – France – A sharp, semi-hard cow’s milk cheese that was almost Cheddar-like in taste and consistency. Cabrales – Spain – M asked for the “blue-est” cheese they had, and after sampling, this was our choice. It was indeed a super sharp, crumbly sheep and cow’s milk cheese (so sharp it was almost metallic, which sounds weird, but was tasty). Robiola Bosina – Italy – The first of two Robiola varieties we tried. This was a more mild, creamy goat and cow cheese. Robiola Rochetta – Italy – As a contrast to the first robiola, this was a sharp, super-creamy (almost runny) blue cheese made with sheep, goat and cow’s milk. We really enjoyed all of our our selections, and felt we got exactly what we wanted: a good mix of flavors and consistencies (granted we did take a while with the process). The plate also came with bread, honey and quince paste. We loved our cheese choices that night, but if we went back, we may end up with a totally different selection of just-as-delicious choices, depending on our mood. We cannot recommend the L’Albatros cheese plate enough! 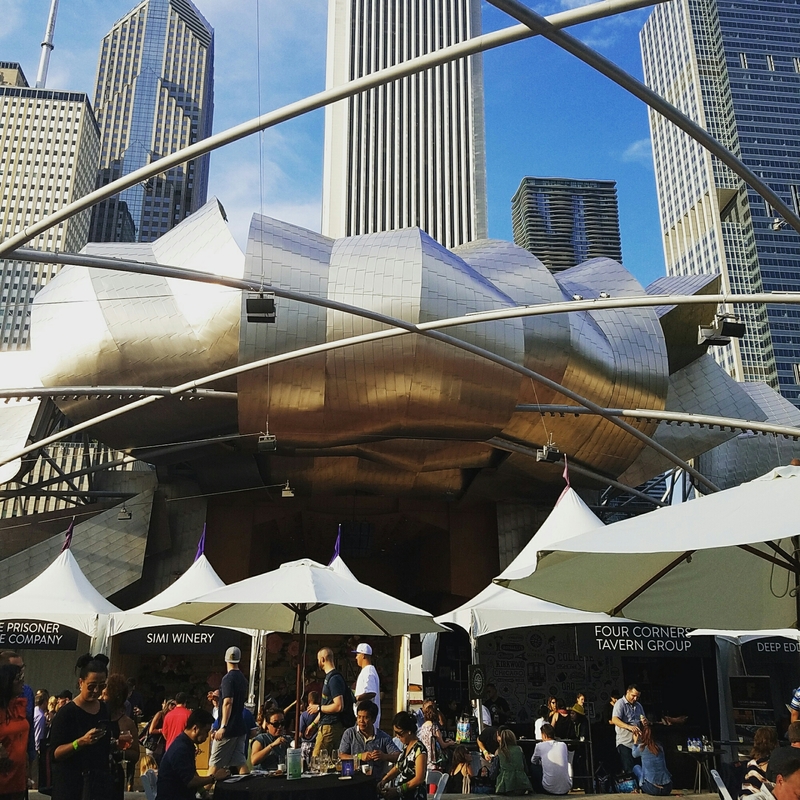 Yesterday, I was lucky enough to be invited to Chicago Gourmet, an annual food and wine extravaganza that showcases some of Chicago’s best restaurants alongside international food and drink. As in years past, it was a wonderful time, and I am working on posting a comprehensive recap within the next few days. In the meantime, you can check out the ETW Instagram feed for some of my favorite Chicago Gourmet pictures. We had so much delicious international food and drink, that is is hard to pick a single thing to use as a teaser, but we decided to go with something refreshing and Italian: The Aperol Spritz. Even though it is technically fall, it still feels pretty summery outside, so why not! 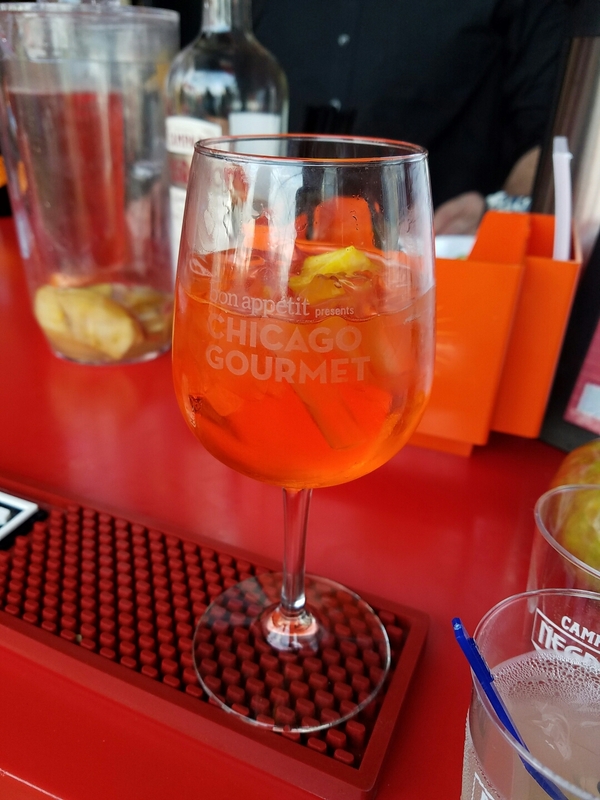 The Campari Group had a booth at Chicago Gourmet, as in years past, and it always fun to try out some of the Italian cocktails there, like the classic Negroni. This year we went for the Aperol Spritz, a refreshing summer-y cocktail made from Prosecco, Aperol liquer, and soda that is one of Italy’s iconic beverages. Aperol is a liqueur made from bitter oranges, gentian and other herbs and spices, and is similar to Campari, but with a lower alcohol content. We have only had it a few times before, but we are fans! Bagna Calda / Bagna Càuda is a homey Northern Italian dish from Piemonte made primarily with butter, oil, garlic and anchovies. It is a mainstay at our own family celebrations, but we have never seen it on a restaurant menu… until now! We were at Della (1238 Prospect Ave, Brooklyn, NY 11218) in Brooklyn with friends, when we spotted the bagna cauda on the menu, and we just had to order it. Della has a homey Italian-inflected menu of fish, hearty meat dishes, homemade pastas and some unusual appetizers (case in point). The homemade pasta was delicious, but the bagna cauda was even better. It came served in a small bowl, with endive, radishes and chunks of bread for dipping. We had to ask for more bread to sop everything up- delicious! We encourage you to make bagna calda on your own for your next party – it couldn’t be easier. Even if you don’t normally like anchovies, you can’t help but love the salty, garlicky goodness! The West Loop is on fire! Well, not literally, but it seems that a great new restaurant is opening up nearly every week, from Japanese to small plates, to Italian. When I was searching for good birthday-appropriate brunch and lunch options, my search led to many options in the West Loop, where we landed on the relatively-new Bar Siena (832 W. Randolph, Chicago, IL), a venture from Top Chef’s Fabio Viviani. When I went to school in Philadelphia, an essential component to my foodie explorations was a monthly pilgrimage to Isgro Pasticceria in South Philly (1009 Christian St., Philadelphia). I used to bring home a box of cannolis from there on the holidays, despite some major flak from the TSA (the major question: Is ricotta a liquid?). Year in and year out, I still think Isgro has the best cannolis, and I think it’s about time they were featured on ETW. Isgro’s is the type of old-school Italian bakery that once graced most major Northern metropolises, and they have been doing business in Philly since 1904. The difference is, Isgro’s is still here, and they are baking up pastries and cookies like it is still 1940. Stepping into Isgro’s is like stepping back into time, from the retro store, to the gruff but friendly service, to the shelves piled high with cannoli shells. There is definitely too much to chose from, so long story short, get the cannoli. The traditional type, filled with ricotta with chocolate chips my favorite, but you can also get special chocolate or mascarpone varieties. However, I think the ricotta strikes the perfect balance of a sweet, but not too sweet, filling and super fresh crispy shell, which is filled to order. The filling to order is essential – as it preserves the integrity of the crispy shell. M pointed out that Isgro’s website is Bestcannoli.com and while that is pretty somewhat boastful – we think it’s true! Beyond that, Isgro’s serves a huge variety of Italian-American favorites like pignoli, biscotti, Rum Baba, Sfogliatelle and tiramisu. On the American dessert side they have heaps of fruit tarts, brownies and spritz cookies. On our last visit, there were even special pastries and cookies dedicated to the Pope’s 2015 visit (and Isgro’s was even tapped to make him dessert). Everything we tried there has been excellent, but we keep coming back for the cannoli. If you are in Philly, definitely give Isgro’s a try, if you like cannolis it is an absolute must.We wish we lived closer!